In the development of speech in children, you should be focusing on three main areas. The first of these, and most obvious, is articulation. If a child is not able to properly sound out words, they will always have problems with speech. Second is language. A child must understand how different parts of a word work together, what role semantics and syntax play, and the social aspects of language. Literacy is the last and third area of focus. The ability to comprehend the meanings of different parts of speech and understand what is being said to you is integral in your ability to effectively communicate. To improve articulation in your child you need to have them practice the sound that is proving difficult repeatedly throughout the day. To begin, only focus on the sound by itself. For instance, to work with the s only make an s sound with no other syllable. After this is mastered, you may add syllables, like s-ah, and then work up to full words. 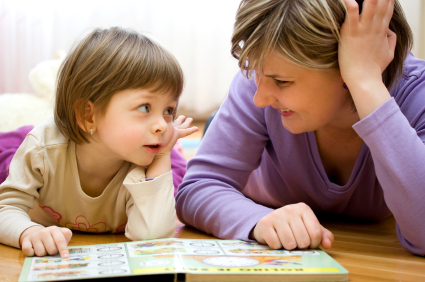 An understanding of language can be greatly enhanced simply by reading or talking with your child every single day. As children see language used and are encouraged to use it, they will naturally build a greater understanding of this concept. Literacy can be built also by reading a book or telling a story. Throughout reading or storytelling, ask your child questions about what they are hearing or saying. For instance, ask them what has happened so far, what they think will happen, and why events are unfolding the way that they are. Many fun speech therapy games and activities can be store bought or are available on the Internet and can be found with just a simple Google search. You can create fun games and activities yourself as well. Try making flashcards with various sounds, morphemes, graphemes, or words that your child is struggling with. On a large white board, you can write a letter with your child to someone they care about, making sure, he or she actively participates in word choice, spelling, and end with having your child read the letter aloud. Another fun game is to recite tongue twisters, having your child clap or snap when they hear a target sound they have been struggling with. For example, in the tongue twister, “Sally sells seashells by the seashore” have your child clap every time they hear the s sound.